A critical remote code execution vulnerability has been discovered in the popular Electron web application framework that could allow attackers to execute malicious code on victims’ computers. 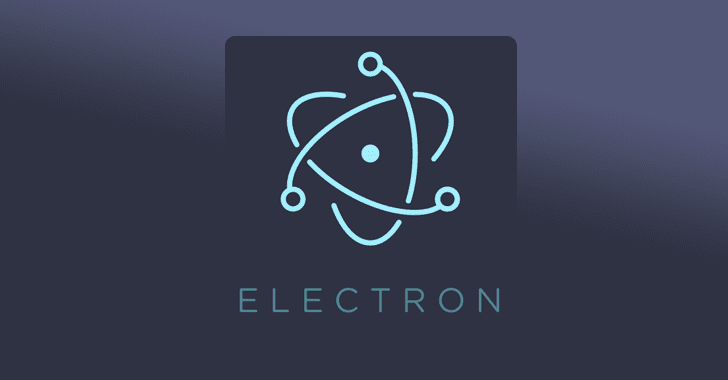 Electron is an open source app development framework that powers thousands of widely-used desktop applications including WhatsApp, Skype, Signal, WordPress, Slack, GitHub Desktop, Atom, Visual Studio Code, and Discord. Besides its own modules, Electron framework also allows developers to create hybrid desktop applications by integrating Chromium and Node.js framework through APIs. Since Node.js is a robust framework for server-side applications, having access to its APIs indirectly gives Electron-based apps more control over the operating system installed on the server. To prevent unauthorised or unnecessary access to Node.js APIs, Electron framework by default sets the value of “webviewTag” to false in its “webPreferences” configuration file, which then sets “nodeIngration” to false. This configuration file with the hardcoded values of some parameters was introduced in the framework to prevent real-time modifications by malicious functions, i.e., by exploiting a security vulnerability like cross-site scripting (XSS). Moreover, if an app developer skips or forgets to declare “webviewTag: false” in the configuration file, even then the framework by default considers the value of “nodeIntegration” as false, to take a preventive measure. However, Trustwave researcher Brendan Scarvell has released proof-of-concept (PoC) code that attackers can inject into targeted applications running without “webviewTag” declared, by exploiting a cross-site scripting flaw, to achieve remote code execution. The exploit re-enables “nodeIntegration” in runtime, allowing attackers to gain unauthorised control over the application server and execute arbitrary system commands. nativeWindowOption option enabled in its webPreferences. Intercepting new-window events and overriding event.newGuest without using the supplied options tag. The vulnerability, tracked as CVE-2018-1000136, was reported to the Electron team by Scarvell earlier this year and affected all versions of Electron at the time of discovery. Electron developers patched the vulnerability in March 2018 with the release of versions 1.7.13, 1.8.4, and 2.0.0-beta.4. So, app developers should ensure their applications are patched, or at least not vulnerable to this issue. For more technical details on the Electron vulnerability and PoC exploit code, you can head on to the Trustwave’s blog post. It should also be noted that the Electron bug has nothing to do with the recently discovered flaw in Signal app, which has also recently patched a critical cross-site scripting vulnerability that leads to remote code execution, whose full technical details are scheduled to be published exclusively on The Hacker News this evening. Stay Tuned!